¡Hola a todos! This week I found interesting resources, I hope you enjoy! Saludos todos! This week we are concluding our March theme of women and Women’s History Month with another great read. Last week I featured the Coleccion Antiprincesas, which provides readers with biographies of underrepresented and under-studied historical Latina heroines. This week, however, we are switching gears a bit, focusing more on the courage and determination of young girls in our everyday lives. 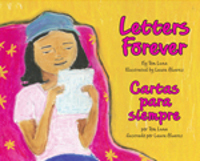 The book for this week is Letters Forever/ Cartas para siempre, written by Tom Luna and illustrated by Laura Alvarez. This wonderful story focuses on a young, female protagonist who has to learn how to navigate her complicated emotions in a difficult situation. 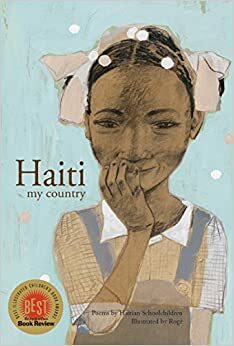 Not only does this book show young readers how to cope with separation and he artache, it also counters stereotypes and challenges negative representations of women and girls by portraying a young girl whose empathy and emotional sensibility is not a flaw or a nuisance, but, ultimately, one of her greatest virtues. This book tells the story of young Camila and her beloved abuelo, Felix, who lives far away in Veracruz, Mexico: “It had been two years since he left San Antonio to return home to Veracruz.” Camila reflects on the bittersweet memories of her grandfather playing his favorite guitar, the requinto, and how he would sing her lullabies when she was a little baby: “He had a deep beautiful voice and played the requinto with an almost angelic touch.” Although the plot following the female protagonist challenges typical, negative representations of women and girls, the character description of the grandfather also challenges expectations of men and boys. The grandfather is sensitive, artistic, loving and participates actively in caring for his grandchild, taking her on outings to the zoo and the park, to name a few, all the while singing or whistling tunes from Veracruz. ¡Hola a todos! Here are some timely resources that I hope will be of use to you. Unfortunately, next week I’ll be absent from the blog because it’s our spring break, but I’ll definitely be back the following week with more to share. As a side note (but an important one! ), we want to take a moment to add our voices to the chorus of advocates who are incensed that the Zinn Education Project would be banned in Arkansas. Here at Vamos we’re devout supporters of their efforts to teach students the diverse histories of this nation. Check out the preceding link not only to learn more about what’s happening, but also for suggestions on how to support the Zinn Education Project in its valuable work! ¡Hola a todos! Happy beginning of March! Here are various resources that I am glad to share. – Just for kicks, I thought you might enjoy Remezcla’s compilation of recipes for perros calientes: Journey Through Latin America’s Weird and Wonderful Hot Dog Creations. My mouth was watering! – Also by Remezcla, here is an Intimate Look at Las Patronas, the Mexican Women Who Feed Migrants Traveling on La Bestia.